These sweet earrings are like wearing a miniature garden! 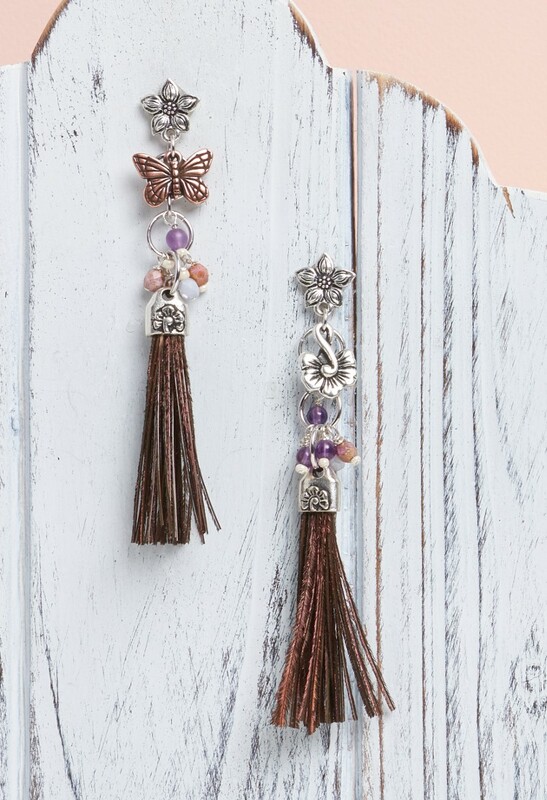 Tip: The tassels shown are made from the barbs of peacock feathers. Use your favorite tassel making materials for this project. See our helpful Pinterest tassel tutorial. Make your tassels and glue into end caps. Allow to dry. Onto one head pin string one seed bead and one 4mm bead in desired order. Form wrapped loop and trim excess wire. Repeat with remaining head pins and beads for a total of 12 beaded dangles. Set aside. Open one large jump ring and attach to top of one tassel. Close jump ring. Open second large jump ring and attach to first. Before closing, add on five beaded dangles in desired order. Close jump ring. Open one small jump ring and attach to second large jump ring. Before closing add on one beaded dangle. Close jump ring. Open third large jump ring and attach to small jump ring. Close. Open one small jump ring and attach to third large jump ring. Before closing add one charm and one earring post. Close jump ring. Repeat Steps 3-7 for second earring.